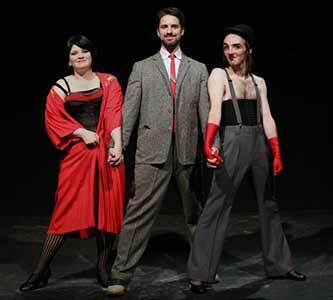 “Cabaret’s” dark brilliance is spotlighted again. “Leave your troubles outside. Life is disappointing. Forget it.” That’s what the sleazy Emcee says. You know that he’s trying to con you. Outside, in the dark night and dark day, Berlin is turning ugly and brutal. Within the walls, Sally Bowles is becoming frantic and Cliff Bradshaw fears the black swastikas flourishing. Moreover Fräulein Schneider worries about broken windows if she encourages courtship from Jewish Herr Schultz. His pineapple looks like a bomb. Remember, schatzi, Cabaret is no light entertainment. In the 1966 musical, Joe Masteroff, John Kander and Fred Ebb epitomized what can be done brilliantly within the confines a musical. Set pieces, songs and dances at the Kit Kat Klub mirror and reflect increasing doom on squalid city streets. Razor-sharp satire echoes Brecht and Weill. You know that too, ja? A new version is running on Broadway right now. The last one lasted more than five years. This 15 Tony Award masterpiece keeps on coming. Now Creighton U. students take on the challenge. Bleibe. Reste. Stay. Movieha! Your favorite movie podcastLazy-i Podcast April 8, 2015!